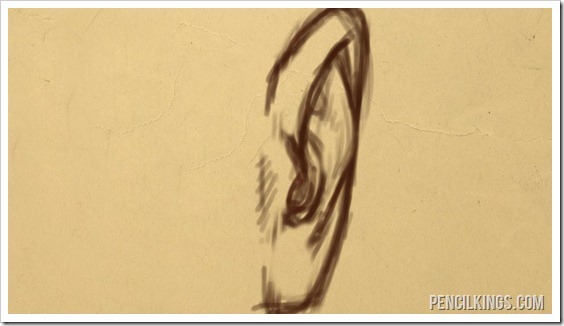 Here’s a look at the final image in this lesson on how to draw an ear. When you learned how to draw an ear in the last lesson it was purely from a side view, and that is the easiest way to both draw and understand the ear, but the problem with this is that it is a flat representation, and it’s easy to forget that the ear has thickness.In order to begin understanding the ear from the front view, first you should understand the ear from the side view with some thickness to it, as if it fills up a box like in this image.If you turn the box in the previous step ninety degrees to the side you will now have a front facing ear, and the box that it is contained within is not very thick. 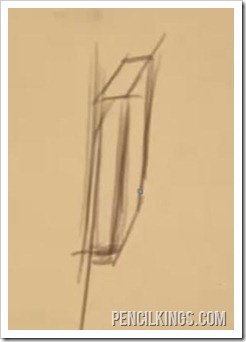 Your drawing of the ear is going to need to fit within this narrow box to have a convincing effect when you draw the ear from the front view. Then draw the curve that starts just above the flap and curves around along the outside edge of the ear. 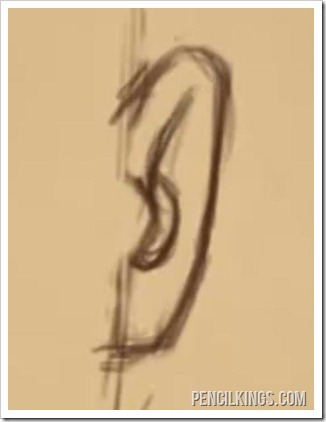 When you begin to draw this detail of the ear you need to remember that it pokes out a little bit past the outside of the ear on most people’s ears before it curves down to the lower part of the ear. 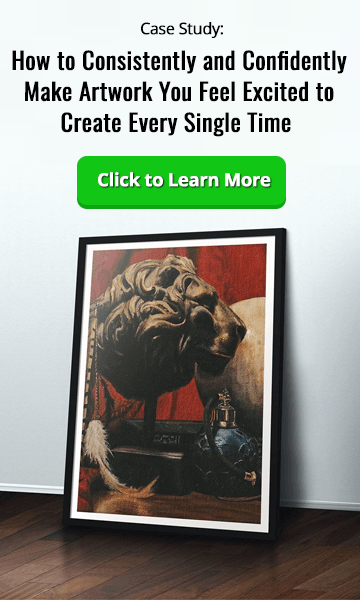 This may seem a little complicated and confusing at first, but don’t overthink this too much. 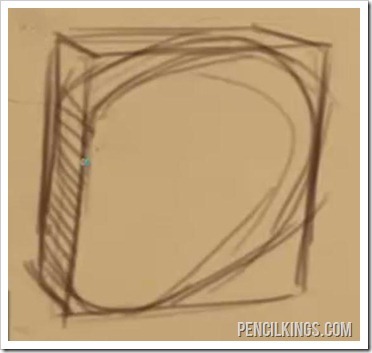 Just follow along with the video, and this image example to add in this detail. Lastly you can add a little bit of shading to further define the volumes of the ear. 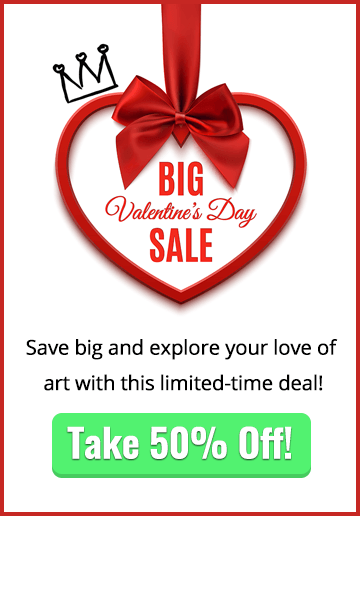 Now that you’ve learned how to draw an ear from the front view, in the next lesson you’ll learn how to draw it from the back. 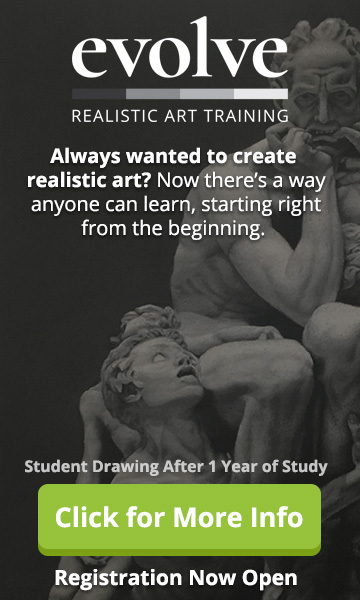 PK 014: Jennifer Llewellyn on Apps, Animation…And Never, Ever, Working For Free.